It occurred to me it would be fun if all the book lovers attending our extended family reunion this summer read the same book. Similar to what we do here in Rochester, NY once a year: “If all of Rochester read the same book,” a great project started by librarian Nancy Pearl in Seattle. At the reunion, we could have an optional, one-time-only gathering to talk about the book. Wouldn’t it would be interesting, I thought, to read a book that explored my husband’s family’s Irish heritage? Easier said than done, because we all know what great storytellers the Irish are. When I asked for book suggestions on the family reunion Facebook page, the list got longer and longer. I hoped no one would suggest James Joyce. Angela’s Ashes was on the list, of course. But with all due respect to Frank McCourt, his ship sailed some time ago, and we have to make way for younger authors. I’m no good at conducting family polls and other administrative tasks, so I made an executive decision. I chose Colum McCann’s TransAtlantic, because it’s hot off the presses, getting lots of attention, and Irish through and through. I hope my husband’s family doesn’t mind I made this unilateral call, especially since I don’t have one ounce of Irish blood. One of the things I most admire about my husband is his unshakeable sense of justice and fairness. I’ve seen this in my in-laws, too. In fact, I’ve seen it in many members of the family I was so fortunate to marry into. This is not just something they give lip service to. In many different ways, they live their beliefs. Maybe being Irish has something to do with it. I work directly across the street from Mount Hope Cemetery where former slave and abolitionist Frederick Douglass, a prominent figure in the history of Rochester and our nation, is buried. There is a riveting scene in TransAtlantic that captures the essence of Douglass’s trip to Ireland in 1845. I hadn’t realized Douglass had traveled to Ireland. That made TransAtlantic, for me, all the more relevant. Members of our extended family have married or plan to marry into families from Nicaragua, Thailand, Saint Lucia, and other countries I can’t name simply because there are too many relatives to keep track of. (They are, after all, Irish.) If you’ve read my blog, you know I’m fascinated with the idea we may inherit from our ancestors a unique sensibility and way of looking at the world. I’m also intrigued by the wonderful new possibilities that may arise with the union of different cultures, possibilities inherent in the children who will be coming to our reunion. In my next post, thoughts about Colum McCann’s TransAtlantic, as well as his Let the Great World Spin. which won the National Book Award. Here is a link to an interview with Colum McCann on Charlie Rose. If you’ve read either of these books, tell us what you think in the comments. Are there books that speak to your own family’s ancestry? Let us know! I discovered your blog through Claire (from Word by Word), Valorie. It is wonderful. Hope you enjoyed reading Colum McCann’s ‘Transatlantic’. I read Claire’s review of it and I think the book is wonderful. I am looking forward to reading your thoughts on it. Your comment on Frank McCourt (‘his ship sailed sometime ago’) made me smile 🙂 From the list of books of Irish authors that you have written about, I have read John Banville’s ‘The Sea’ and loved it, mostly for Banville’s prose. I have read a few other books by Banville now and I think he is one of best prose stylists today. Your comment on James Joyce made me smile. I have read one book by James Joyce – ‘A Portrait of the Artist as a Young Man’ because one of my friends wanted to do a readalong (he didn’t read it in the end, but I am glad I did). I am hoping to ‘tackle’ ‘Ulysses’ someday. Happy reading! Well, I have have to read Banville, then – so many books, so little time. I’m about to post about TransAtlantic. I’m definitely a McCann fan now. Thanks for stopping by here, I am glad to “meet” you, Vichy. Hope you enjoy reading Banville’s works, Valorie. I am glad to meet you too. Looking forward to reading your post on ‘Transatlantic’. I read Let the Great World Spin and thought it was ok, but Transatlantic was a great read and I have Dancer on the shelf. 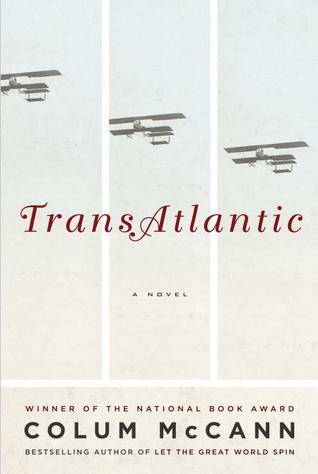 I really like McCann’s writing style and I think the historical context of Transatlantic, which offers more than just the stories he writes, is what made me like it more than his previous work. The combination of great prose, storytelling and historical context. Thanks for telling us more about Frederick Douglass, the kindle is good for a quick look up on historical figures, but nothing came up for him, so I wasn’t sure if he was a historical figure or not. It’s a great choice. I look forward to reading your thoughts on it. Thanks, Claire, I like what you said about historical context – that’s what intrigues me about it, too. I haven’t read it yet but will immerse myself this weekend! Alas, I only read “Trinity” years ago and loved it. But “Transatlantic” is on my reading list. I’ll be interested in hearing what you have to say about it. I’m off to a family reunion tomorrow in Seaside, Oregon, so your post seems timely. Wonderful idea about reading a book beforehand to discuss. I’ve read two books by McCann and loved them both. Dancer, based on the life of Rudolf Nureyev (I believe), and The Side of Brightness, about immigrants (including Irish) who tunnelled under NYC to build the subway syustem. I will look out for this new one. Enjoy your forthcoming reunion. I will have to read his earlier work. Haven’t yet gotten into Transatlantic. And don’t forget Marian Keyes: Watermelon, Rachel’s Holiday, Sushi for Beginners, This Charming Man, the Brightest Star in the Sky etc etc. Chick lit with an “Irish Diaspora” theme that deals with serious themes (drug addiction, domestic violence, AIDS, bereavement, etc.) while still being very funny and fun to read. Thanks Irene, I didn’t know about her. These sound good.